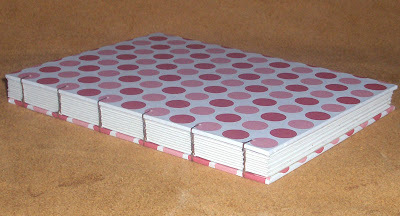 Continuing with our line-up of books from the second swap, this polka dot book came from Kristin, KristinCrane.Etsy.com. 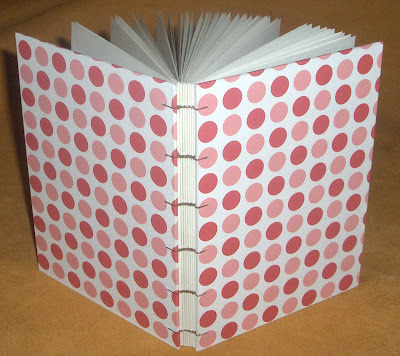 This hard cover blank book has a fun red and pink polka dot pattern on the front and back, and the end pages inside are a contrasting citrus colour; it is very neatly sewn with brown linen thread using the Coptic chain stitch binding. Kristin uses all archival materials in her books. Visit KristinCrane.Etsy.com to see more of her books. I was the lucky one to get this pretty book! It's really very nice! I got her book in the first swap and it was just as lovely! thanks :) i'm so glad you guys like your books. i think the swaps are my favorite part about BEST.